Fire crews have returned to a derelict home where they battled a ferocious fire last night. 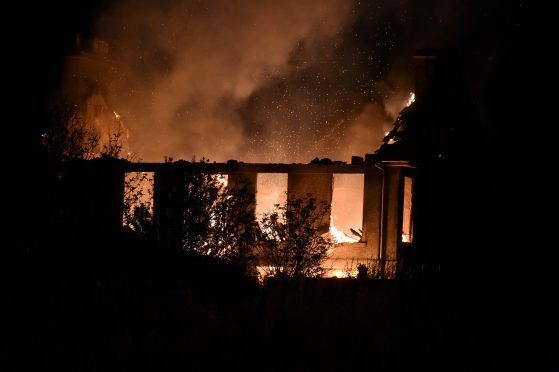 The alarm was raised at around 10.05pm and emergency services made their way to the house near the site of a former hotel on the outskirts of Aberdeen. Smoke was seen rising high into the air from Hillside House at Portlethen and the northbound stretch of the A90 was closed. Fire crews were able to get the blaze out by around 11.30pm but were on the scene for several hours to dampen down the old property. No one was injured in the incident. The cause of the blaze is still unknown and no investigation has been launched as yet. A Scottish Fire and Rescue Service spokeswoman said fire crews have gone back out to check the property is still safe.